Ryanair's chief executive Michael O'Leary could earn almost €100m if he doubles either the profitability or share price of the carrier within five years, under a new share option scheme announced by the airline. 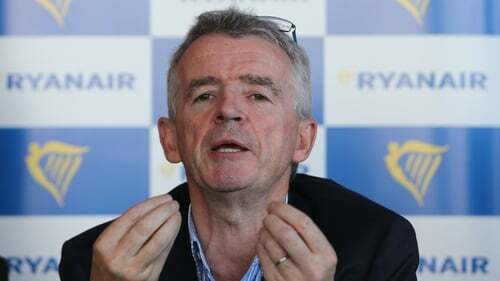 Michael O'Leary said last week he would stay for another five years at Europe's largest low-cost airline, which announced a €20m loss for the third quarter due to weaker fares. Under the new options scheme he will be granted the option of buying 10 million shares at the current share price of €11.12 if he either increases annual profit to €2 billion from a forecast of €1-1.1 billion in the current financial year, or if the share price rises to €21, the airline said. "The terms of the options will require him to double Ryanair's profitability to €2 billion per annum and/or increase the share price to €21 per share over the next five years to qualify for all of these options," Ryanair said in a statement. If the share price hits €21, O'Leary would earn a profit of €9.88 on each of the 10 million share options. The airline said it has also offered each of its 11 non-executive directors options on over 50,000 shares each on the same terms. Ryanair's shares have fallen from a record high of €19.39 in August 2017 due to a combination of staffing issues, strikes, higher fuel costs and increased competition on European short-haul routes. While it was in the red for the third quarter it is still expected to make a profit for the full financial year. Michael O'Leary, the airline's second-biggest shareholder with 46 million shares, or a 4% stake, will move to become CEO of a new group structure, the airline said last week. Under his current contract he earns "approximately €1m" a year and is eligible for annual bonuses of up to 100% of his salary depending on performance, according to the company's annual report.